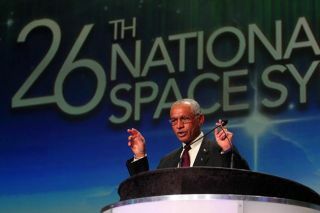 NASA administrator Charles Bolden speaks at the 26th National Space Symposium in Colorado Springs, Colo. This story was updated at 7:47 p.m. ET. COLORADO SPRINGS, Colo. ? Change may be difficult for NASAbut it is vital for the space agency's future, NASA chief Charles Bolden toldan audience of space industry experts and representatives Tuesday. Bolden's talk, delivered to government, military and privateindustry space workers here at the 26th National Space Symposium, comes justtwo days ahead of a major space policy speech President Barack Obama ispreparing to deliver Thursday in Florida. Both leaders are facing the tough jobof defending their newvision for NASA to a sometimes skeptical public and Congress. The Obama administration outlined the new plan for theUnited States' space agency in its 2011 budget proposal released in February.That vision calls for an increased focus on technology development aimed towardpossible missions to the moon,asteroids or Mars. It also replaces NASA's current Constellation program to goback to the moon and beyond, which Bolden called "unsustainable." "Some of the controversy about what were about to do ?I think a lot of it comes from people who are nervous about doing newthings," Bolden said. "I would say, as we are about to do somethingthat a lot of people don't think we can do, take a deep breath and help usfigure out a way to make these things work. Because I'm convinced we can doit." A point of contention over the new plan has been thecancellation of Constellation's Ares rockets and the Orion crew module plannedto fly atop them. These spacecraft were designed to replace the space shuttle,which is dueto be retired later this year. Just four more shuttle flights remain, oneof which is under way right now aboard the shuttle Discovery. Instead of developing those new spaceships, President Obamaproposes that NASA encourage privatecompanies to development a transportation system to take astronauts tolow-Earth orbit and the International Space Station. "Government has blazed the path to low-Earth orbit inthe past," Bolden said. "New players are now ready to engage thatfield." But not everyone agrees that the commercial space industryis ready. ?I think we want it to succeed so much that we will miss theinherent risks that are in that approach,? said Scott Pace, director of thespace policy institute at George Washington University in Washington, D.C.,during a separate Tuesday panel at the National Space Symposium. Some critics have charged that leaving the work oftransporting astronauts to low-Earth orbit to commercial players would endAmerica?s dominance in space, or lead the nation on a path toward giving up itshuman spaceflight program altogether. In response to that accusation, deputy NASA administratorLori Garver said, at the same panel, ?Wow. This program does the opposite. Infact it was the other program that was doing that.? She said the Constellationprogram actually would have eroded America?s human spaceflight abilitiesbecause it was such an unsustainable path. If NASA did cede this duty to private companies, that wouldfree up the agency to work on new spacetechnologies to travel farther out into the cosmos. ?We need to reinvest in cutting-edge technologies,? Garversaid. ?We want to expand the boundaries of human space exploration beyond ourhome planet.? Bolden mentioned inflatable space habitats, novel spacepropulsion mechanisms, and next-generation heavy-lift rockets as a few of theavenues for research. He has said repeatedly in the past that NASA will notabandon the work performed under the Constellation program. The agency will carry over know-how and research to the newplan as it applies, Bolden has said. "The fundamental goal has not changed ? to boldlyadvance human presence beyond the cradle of Earth," he added Tuesday. Bolden reaffirmed President Obama's support for NASA and forthe future of space exploration. In an era of extreme budget pressure, he said,the president has decided to increase NASA's budget. "President Barack Obama is strongly committed to ourfuture in space," Bolden said. "We are so committed that we made thehard choice to undertake a new direction... to find a more affordable andsustainable path. "Between the space symposium underway here, and Obama'sspeech on Thursday, Bolden said it's an important time for the space industry. "This is a big week for the entire nation," hesaid. "A week in which probably more people than ever before will bethinking about space." Another important element of the new plan for space is the emphasison education and outreach to youth, Bolden said. "I can't emphasize enough how passionately PresidentObama and I feel about educating and inspiring the next generation," hesaid.